The Five Bar Swordtail (Pathysa antiphates itamputi) is a medium size butterfly belonging to the Papilionidae family. It can be found in forested areas, riverbanks or the edges of the forest. It is a strong flyer with a rapid erratic flight. Often, it is seen flying high at tree top level. That's really a beautiful butterfly, Cher. I don't think I see it before. I like all of your photos! 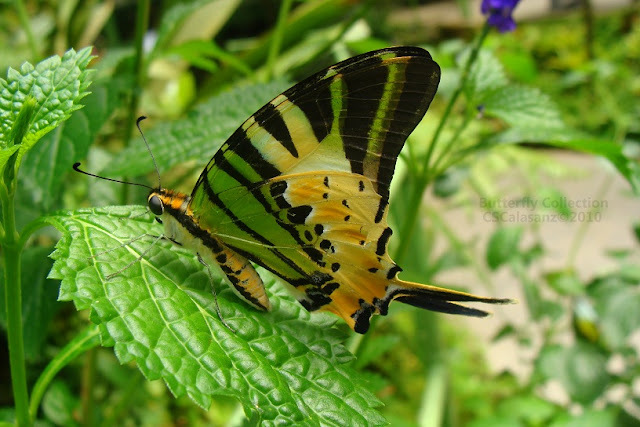 Oh I love butterflies - this is a beautiful one and it's a great photo! My Critter post, please come and see. I love this photo! How cool that one set of wings stays still! Beautiful butterfly and great photo.